The best for you and your family depends on how you cook, so we will look at the best all gas ranges: Wolf, Thermador, BlueStar, Jenn-Air, and Miele.However, first, we will explain the difference between all gas and dual fuel. We did, however, write an article on Best Dual Fuel 36-inch Ranges and our recommendations are still different for dual fuel. Dual fuel is a dryer, more precise heat. It is better for baking. Straight gas is moister and better for roasting and broiling. Every dual fuel range is self-cleaning, but less than half of all gas ranges have a self-cleaning option. Wolf and Miele have also recenlty upgraded their dual fuel ranges. Miele has their MasterChef controls for push button controls whereas Wolf has twin convection and upgraded BTU power. BlueStar is an American range company known for manufacturing high quality ranges with commercial -grade craftsmanship. BlueStar specializes in all-gas ranges. They are most widely known for their open burners and customization. 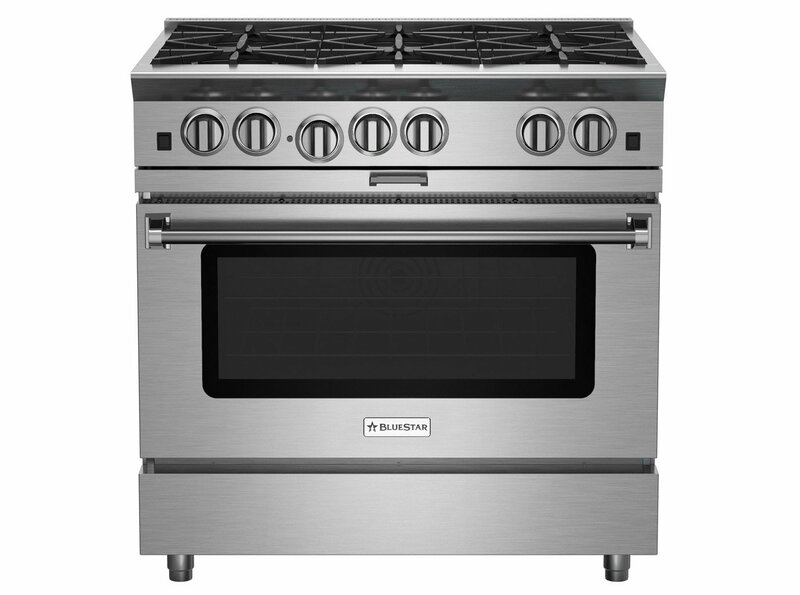 Although BlueStar makes several different ranges, the platinum series sport their best features. Who make the best 36-inch all-gas range? Your range choice will really depend on what you value. So we broke each range down by categories with multiple or one winner. Hope this helps to make your choice! can stay in the oven during the self-clean cycle.